As I post this weekly recipe for beef stroganoff, I’d like to call your attention to a couple of exciting new features on the blog. First, I’ve added a “Print” feature for each post. Suggested by my mom, I think this is a great idea that will hopefully make it easier for you to give these (usually) delicious recipes a try. I’ve also added a Twitter feed – I hope you all will follow me (@mainerootsgirl) – and I hope the feed also provides you with helpful information and updates about Maine news and events. 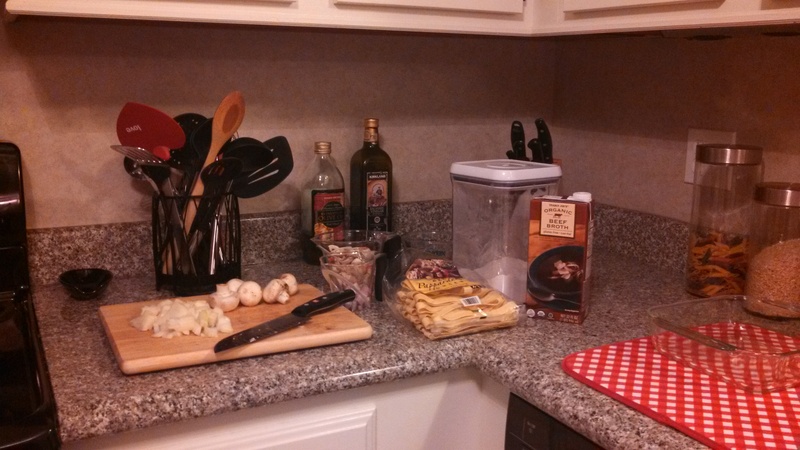 And now, let’s get down to the business of beef stroganoff. 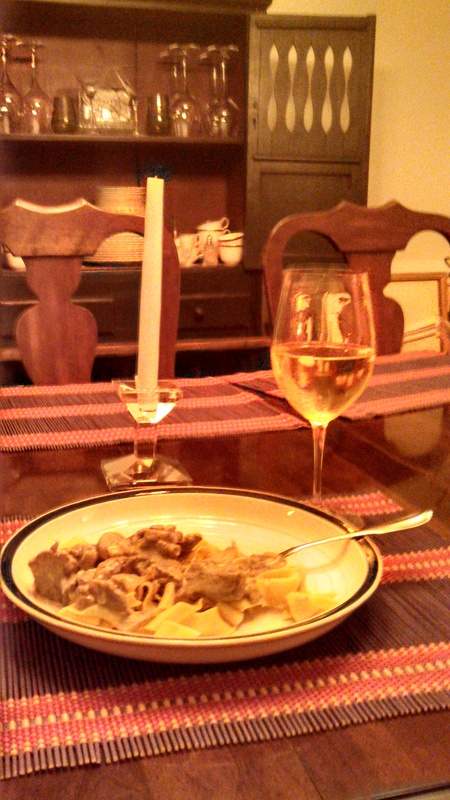 This was my first attempt at making beef stroganoff. From this experience, I learned that it’s a fairly simple dish and my former intimidation was uncalled for. The below reflects something of a combination of two recipes – the first, found in Maine Home Cooking on page 98, is titled ‘Venison or Beef Stroganoff.’. Maine Home Cooking has a number of interesting venison recipes (such as this one) that I would really like to try – hopefully this November my husband will get a deer while ‘upta camp’ so I can share them with you. The second recipe I took pieces from is from that well-loved, favorite cookbook of mine – Recipes from the Maine Kitchen – and is on page 110. Both original recipes served 8 people, which would be overkill at our house. I halved it to 4 servings and we enjoyed it for two nights. 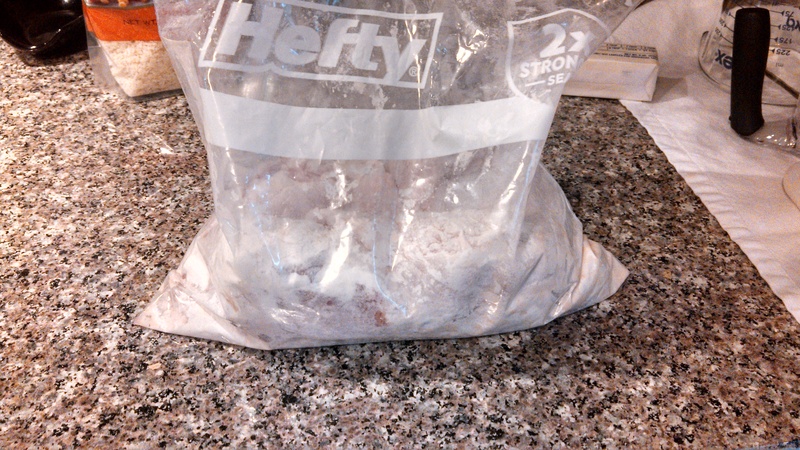 Sprinkle the beef (or venison) with paprika, salt, and paper. 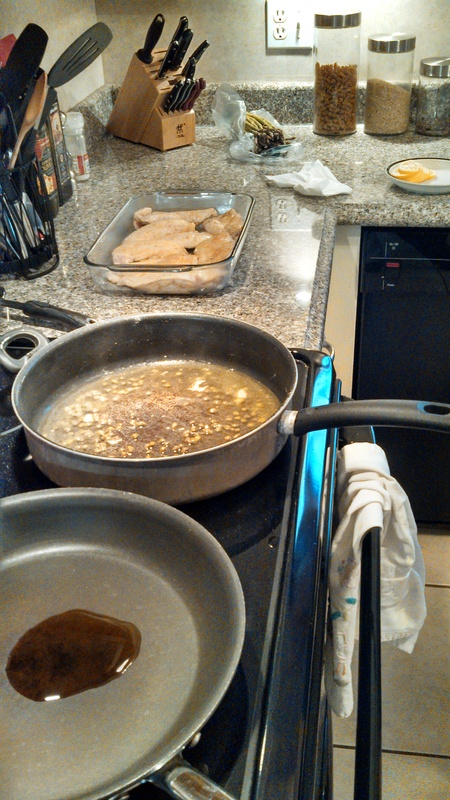 In a large saute pan, melt half of the butter and olive oil over medium high heat and brown meat for about 1 minute. Set the meat aside, and add the remaining butter to the pan. Saute mushrooms until the liquid has been rendered, continuing to cook for a few minutes after this. 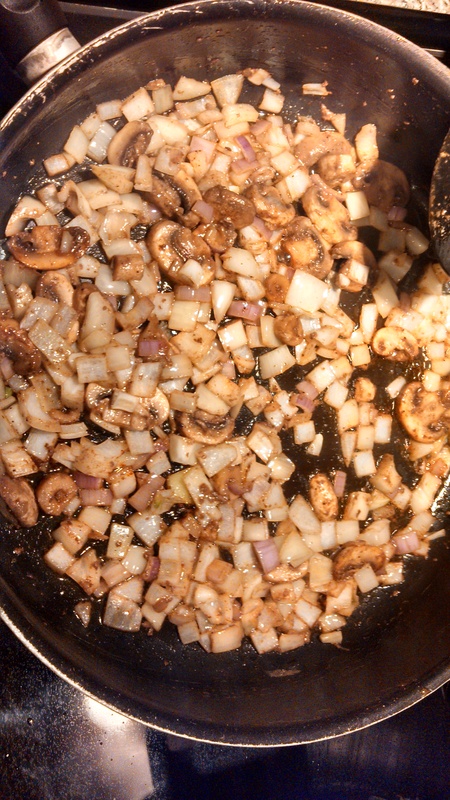 Add the onion and shallots and saute until soft and the mushrooms begin to brown. Sprinkle the flour over the mushrooms and stir until mixed. Add the wine, stirring and boil for 1 minute. Add the stock, reduce the heat and simmer until slightly thickened (about 10 minutes). Remove from the heat, stir in the sour cream, and add the meat and any accumulated juices. Reduce the heat to low ad cook for a few minutes, until warm. Do not boil, or the sour cream will curdle (ick!). Correct the seasoning and serve over egg noodles. The beef stroganoff was excellent. Flavorful meat is important in any recipe, and I am spoiled because Nick and I buy almost all of our beef from Omaha Steaks these days. We love their products, and the beef strips were nothing short of extraordinary in this dish. One thing I may handle differently next time is the timing of adding the flour. I think adding it earlier, so the mushrooms and flour brown together, could make for a better end result. I would also use a bit less of it – it’s already a pretty thick sauce, and I felt the flour made it a bit too sticky (I added a bit more white wine and beef stock, in this case). Regardless, this was a big hit in our house and I highly recommend giving it a try. I hope you’ll share your results! Categories: Eat, Play, Weekly Recipe | Tags: beef stock, beef stroganoff, egg noodles, Maine cooking, mushrooms, Omaha Steaks, recipe, venison stroganoff, white wine | Permalink. This recipe is one I’ve wanted to try since first flipping through my cookbook, Maine Home Cooking. It spoke to me for a number of reasons: first, although its name is certainly not connected to my Aunt Libby, I can’t read the title without it calling her to mind (she passed away of breast cancer when I was 14, and was a very special woman); second, the ingredient list includes several favorites of mine (capers, white wine, and lemon); and third, I love any chicken dish that requires me to flour and fry the chicken lightly before baking in a sauce. These inevitably seem to turn out well! The recipe can be found on page 90 and serves 5-6. Preheat the oven to 350 degrees. Slice each piece of boneless chicken horizontally. Put the slices between two pieces of waxed paper and pound them gently with a mallet or rolling pin. Toss together the flour, salt, and pepper and dip each piece in the mixture, shaking off the excess. Put a little olive oil in a heavy skillet and make it quite hot. 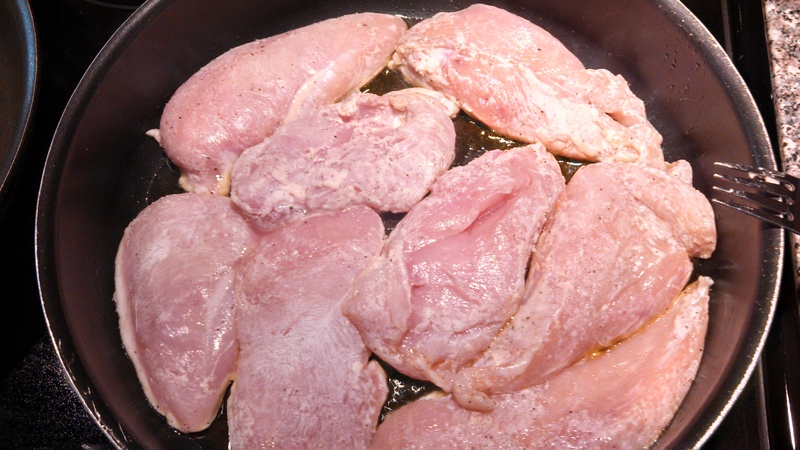 Cook the chicken slices for 3-4 minutes per side, and remove them to a baking dish. Add the capers and wine to the pan and cook until you can scrape up the little stuck-on bits. 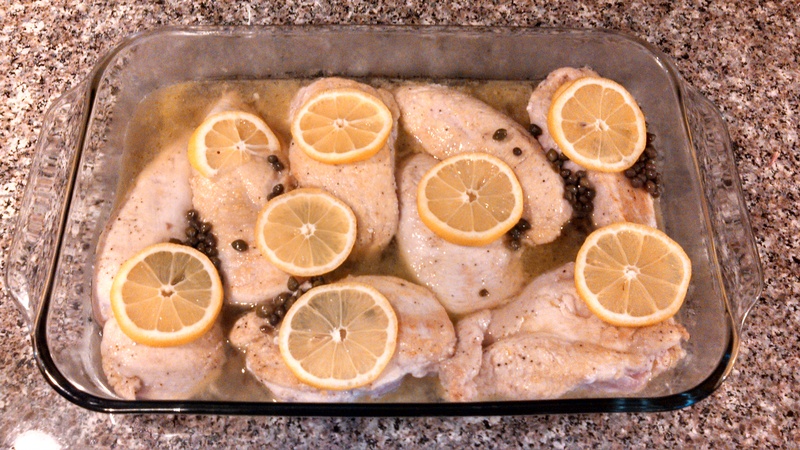 Pour it over the chicken in the baking dish and lay the lemon slices over the chicken. Put the chicken in the preheated oven for 25-30 minutes. Lay the chicken on a platter, pour the juices over it, distribute the lemon slices, and sprinkle with parsley. The lemon slices really make this dish visually appealing. I made this recipe for my in-laws first night in town over Easter weekend. 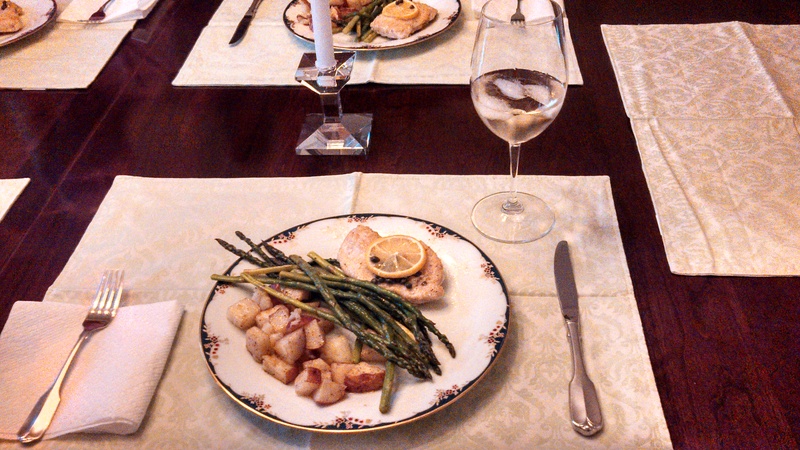 As sides, I roasted red potatoes and sauteed asparagus. The chicken was tender and flavorful (although it could have benefitted from slightly more salt and pepper! ), and all in all, the meal received rave reviews. 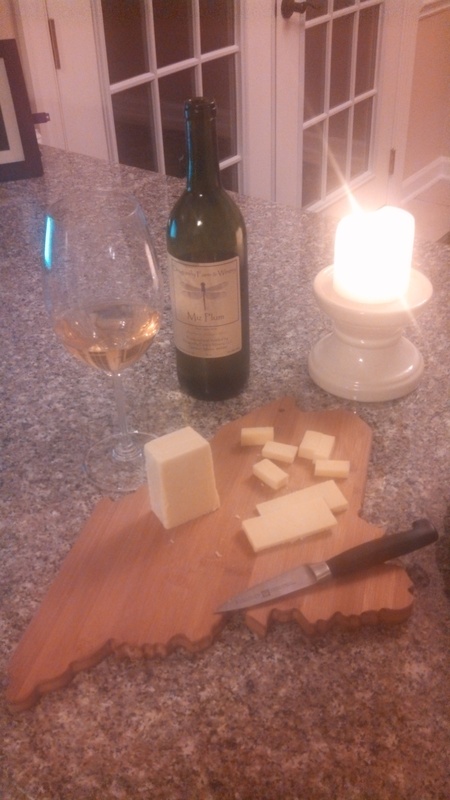 It was also a pretty easy, straightforward recipe that gave me the opportunity to indulge in a glass of wine. 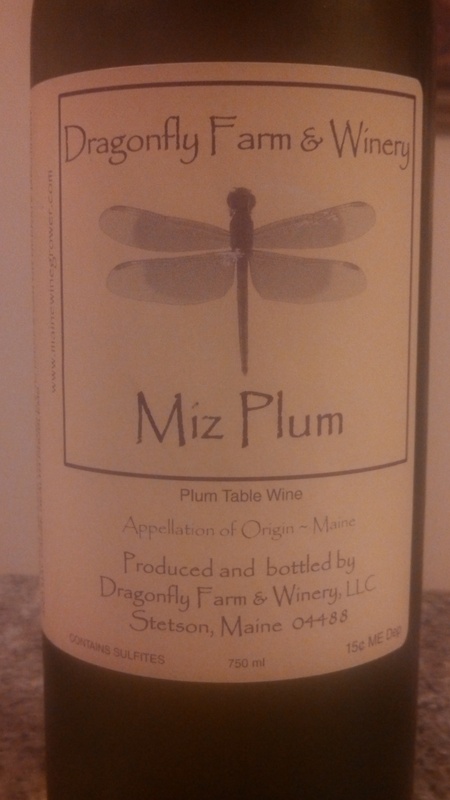 Categories: Drink, Eat, Weekly Recipe | Tags: capers, chicken recipe, cooking, lemon, Maine Home Cooking, Maine recipes, white wine | Permalink. On Sunday evening, we invited a family over for dinner – we’ve become close with them over the last several years, as my husband has been a mentor to their son (also named Nick) since he coached him in soccer as a freshman in high school. Now, ‘little Nick,’ as I call him – although he’s probably over 6′ feet tall – is half way through his freshman year of college studying architecture at Washington University in St. Louis. The entire family is wonderful – Nick and his younger sister, Annika, are both friendly, considerate, intelligent, polite, bilingual (the benefit of having a German father) – exactly the type of children most parents hope to have (not to say Nick hasn’t had his missteps – but frankly, I’d rather have a child who does test the limits a bit). Their parents, Jane and Klaus-Dieter, are also lovely, and they have hosted us at their home many times. I can attest to what a fabulous cook Jane is. 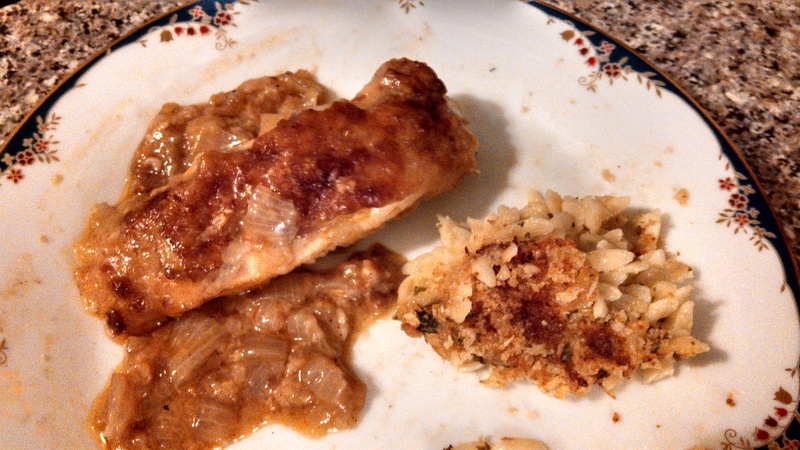 I decided to make the Gruyere Chicken Dish from – you guessed it – my favorite cookbook, Recipes from the Maine Kitchen. I promise (promise, promise) that my next ‘Weekly Recipe’ will come from one of my other Maine cookbooks – I just truly love this one that much! This recipe was perfect for the occasion because it is easy to cook in a large amount – the original recipe is for 12! And it is delicious. After all, how could something with both gruyere and parmesan cheese go wrong? I also took the cookbook’s recommendation and made parsleyed orzo as a side dish, in addition to a green salad. I’ll share that recipe as well. Flour the chicken breasts and melt butter in a large skillet. Brown the chicken breasts and set aside. In the same skillet, melt 4 tablespoons of butter and saute the onions until golden. Mix together the Parmesan cheese, Gruyere cheese, paprika, and breadcrumbs. Butter a large casserole dish, large enough for the chicken to be placed in one layer (you may need two dishes). Preheat the oven to 375. Layer half of the onions into the bottom of the casserole, and place the browned chicken on top. Cover with remaining onions, and sprinkle the cheese mixture on top. Dot with 4 tablespoons of butter. Mix the wine and chicken stock together and drizzle over the dish. Bake uncovered for one hour, and let rest in the oven at 200 degrees for an additional 15-20 minutes. The parsleyed orzo recipe is on page 79. I’d never made it before, but I have to say, it was excellent. It smelled delicious and browned up beautifully. My mistake was not adding quite enough salt and pepper during the mixing process. Boil orzo with the garlic for 10 minutes and drain in colander. Rinse with cold water. Remove garlic and mash with fork. 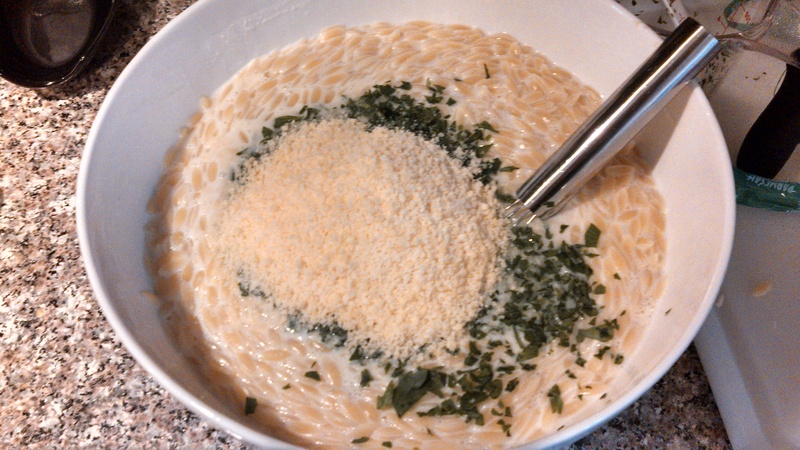 Whisk garlic with cream, add orzo, chicken stock, 3/4 cup Parmesan cheese, and 1 cup parsley. Season with salt and pepper. Pour into a buttered, 2 quart baking dish. Mix breadcrumbs with remaining Parmesan cheese and parsley, sprinkle over orzo and dot with butter. Bake for 1 hour and 25 minutes in the oven at 325 (this baking time may be a bit long – next time, in my oven, I’ll go with about an hour and 15 minutes). Our dinner party was a success, and everyone gave the Gruyere Chicken Dish rave reviews. My hubby and I are about to enjoy the leftovers, so it’s time to relax! Categories: Drink, Eat, Weekly Recipe | Tags: chicken, chicken stock, dinner party, gruyere, gruyere chicken dish recipe, onion, orzo, parmesan, Recipes from the Maine Kitchen, white wine | Permalink.